Identifying the SQL Server database state and how a database can be moved between these different states is considered an important aspect of SQL Server database administration . A good understanding of this will help us in troubleshooting and fixing many database problems and issues. A SQL Server database state specifies the current running mode of that database. The database can be running in one state at a given time. The current state of a database can be verified by selecting the state_desc column of the sys.databases catalog view. From the database availability side, the database can be fully available or fully unavailable. Between these two main states, a smooth transition should have occurred in optimal scenarios free of any problems that may interrupt that transition. In this article, we will describe the seven database states, the reasons for these SQL database states occurrences and how the database will act when operating in those states. A SQL database that operates in an ONLINE state is available for end users access and functioning normally. In the ONLINE database state, the primary filegroup is online, although the critical database recovery process of the undo phase may still not have finished completely. The ONLINE state is the healthy state that the SQL database should move to smoothly after starting up the database. The RESTORING database state means that the user has initiated a database restore process, using RESTORE DATABASE or RESTORE LOG T-SQL command, in which one or more data files of the Primary filegroup is restored, or one or more secondary files are being restored in offline mode. In effect thish means that the database is not available for the end user access during the restoration process. The default database restore option is the RECOVERY option, in which the database will be brought online back after completing the database backup restoration. Using the NORECOVERY restore option, that is used to restore multiple backup files, the database will be in the RESTORING state until it reaches to the last file in which the WITH RECOVERY option is used to bring the database online again after restoring the last backup file. The Database RECOVERING state is a transient state, in which the database is performing a recovery process and will become ONLINE automatically, if the recovery process completed successfully, after the database startup. The recovery process consists of two main phases, the Roll Forward phase, in which any transaction that is committed while shutting the database down and not yet written to the database data files will be processed. In the Rollback phase, any transaction that is uncommitted during the database shutting down will be rolled back. If the recovery process failed for any reason, the database will be moved to the SUSPECT state and will become unavailable. Working in RECOVERING state, the database will be unavailable for the users. The RECOVERING database state is a transient state as we mentioned previously, that is performed on the database startup or after restoring the last backup file. In normal cases, the database will not be in the RECOVERING state for long time. One of the most common issues that leads the database to stay in RECOVERING state, for a longer time and slow down the recovery process, is an excessive number of Virtual Log Files (VLFs), up to tens thousands of them, inside the database transaction log. Having your database stuck in RECOVERY PENDING state, means that the database recovery process failed, due to missing files or potentially for resource-related reasons, preventing the database from being recovered successfully, but that the database is not damaged. In this case, the database will be unavailable for the user access and required a further user action to resolve the error and let the recovery process be completed successfully. A database that is in the SUSPECT states means that the database is not available for user access. In this database state, the database recovery process has started but not completed successfully, requiring further user action in order to fix that issue and repair the corrupted files. 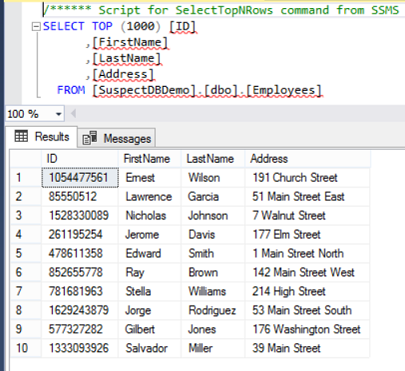 SQL Server marks a database as SUSPECT due to many reasons, such as database files corruption, unavailable database files or improper shutdown of the SQL database server while running a big transaction. What we will do is start a transaction that will update the testing table without committing it, and perform a CHECKPOINT command to write it to the disk. The database can be changed to the EMERGENCY state by a sysadmin user action, in order to safely perform database maintenance or for troubleshooting purposes. In this state, the database will be in single-user mode to be repaired or restored, marked as READ_ONLY where you can export the data out of the database, logging is disabled and the access is restricted only to the sysadmin role members. In this article, we’ve described seven different states of a SQL Server database, showed how a database operated in these states and how to move the database from one state to another. Changing the database state is critical and you should make sure that this change is performed at the right time, in a correct situation, and that you have the recovery plan in the case of failure.